Hailing from New York, Dominique Hart is a creative branding & marketing strategist, dynamic speaker and entrepreneur who is passionately creative, and is no stranger to a challenge. Dominique also has extensive knowledge in social media strategies for business and your personal brand. She championed her Bachelor of Arts degree in Advertising (Art Direction) as well as her certificate in Entrepreneurship from Temple University in the Spring of 2012. In the corporate advertising industry, she recently served as a Creative Intern at UniWorld Group, Inc in the summer of 2013. Her portfolio of responsibilities included development and/or execution of concepts for logos, print ads, interactive platforms, and of course social media. Based in New York City and serving internationally, she is the Founder and CEO of her creative company, Dynamik Endeavors, LLC (www.DynamikEndeavors.com), which is a premier source for Dynamic creative advertising and social media for every creative entrepreneur. Dominique has a hidden passion for dance and appreciation of all things that involve creative expression. Dynamic in all her ways, her ability to merge concept and design, has allowed her to collaborate with a wide range of independent clients and sectors including: well-known advertising firms, major non-profit organizations, religious organizations, community-based organizations, fortune 500 companies, and international consumer intelligence agencies. Dominique Hart is currently accepting projects from advertising agencies, design studios, medium-sized companies and direct clients who seek out her expertise and services. To know more about or to work with Dominique, you can visit her official website at www.DominiqueHart.com and of course stay in touch wither her on Twitter & Instagram @MeetDominique. 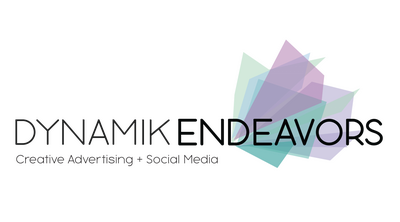 You can also see what she’s creatively up to with her clients on all social media platforms @DynamikEndeavors.